Who doesn't love a good Sunday roast? Everyone has their favourite bits (definitely roast potatoes for us). A quintessentially British tradition that brings friends and families together once a week for a simple getaway from the every day. Rather than letting timings get the better of you, use these hacks to get your roast delivered on time with ease. Make your Yorkshire pudding batter the night before and keep it in the fridge- it's one less thing to worry about the next day. Par-boil your potatoes the night before and store in the fridge, this will save you 20 minutes of prep and cooking and will simply leave the roasting process to manage. Wash your veg and keep in a bowl covered by your chopping board on the counter overnight. 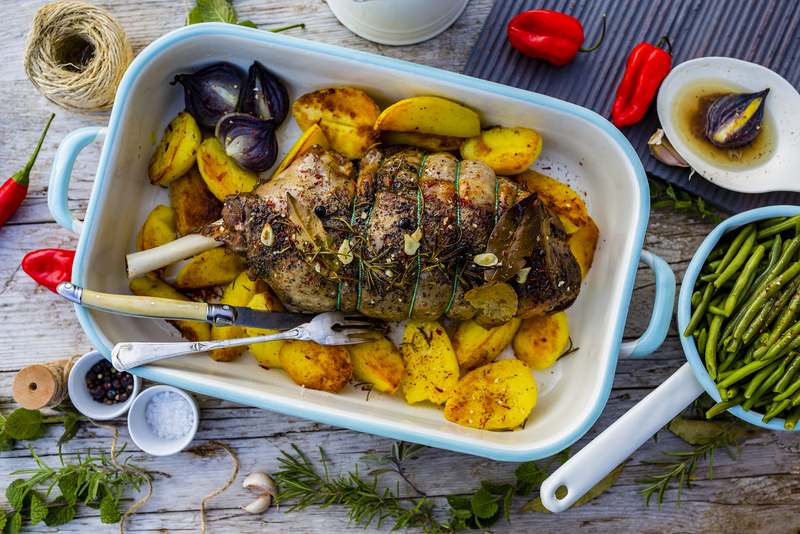 If you're using beef or lamb, rub the joint the night before with salt and pepper and leave in the fridge overnight, ensuring it's covered before you go to bed. Preheat your oven and check your cooking times for the meat by weight. Get the meat, potatoes and Yorkshire batter out the fridge and allow to reach room temperature. Peel and chop your veg- if you don't want to get carried away in dressing up the sides, invest in a steamer for fuss-free cooking. Simply put your food on the shelves, water in the steaming compartment and set your temperature and timer ready to go. Because dripping is generally a treat, make a less guilty glaze for your potatoes and meat- simply heat up some olive oil and butter in a saucepan, once the butter has melted add a clove of garlic and allow to infuse in the mixture. Brush over your roasting joint leaving enough to coat your potatoes in. Get your meat in the oven first and cook accordingly. When the meat has 40 minutes or so left to go, put your potatoes in and the tray for your Yorkshires with the butter in the oven to get hot (this should take about 20 minutes). You want the fat to be piping hot before you pour the batter in to get them deliciously crispy. Once the meat has finished in the oven, let it rest for 20-30 minutes and turn your steamer on. The potatoes and puds will take 20-25 minutes to cook. While the potatoes and puds are cooking, get your gravy going- make a roux from butter and plain flour and use some shop bought stock to make your gravy. The general rule is to match your stock to your meat, so if you're making lamb, use lamb stock for the gravy. Carve your meat and serve your Sunday roast!